If you’ve just started making shaving soap, you might be content to slop it into a mug or bowl from around the house for testing purposes. But sooner or later, you’re going to want a shaving soap mold. You can get a specialized soap mold like this one from Brambleberry, but after shopping for ingredients and tools for soap making, your wallet is probably hurting. Chances are, if you’ve got acquisition disorder – all too common among wet shavers – this is familiar territory to you. So, we’re going to take a look at some alternative shaving soap molds. This way, your soap ends up in a more or less attractive shape which can be stored inside wax paper, etc. Many people who look for cheap shaving soap molds end up using a Pringles can or a length of PVC pipe. These things will work… sort of. If you’re making a small batch, they will be fine – don’t be afraid to begin with one of these free or almost-free options. But can you imagine trying to remove a 12″ long log of shaving soap from the PVC pipe it set in without squishing, breaking, or deforming it – and then cutting it nice and evenly? Plus, if you’re going to use KOH and make a softer soap (like the basic shaving soap recipe), this gets even harder. Add in the fact that this frustrating process over multiple batches is time-consuming and annoying, and suddenly $10 seems like a pretty good deal. In my opinion, the best options are silicone molds. Silicone is flexible, easy to clean, inexpensive, and highly heat-resistant. Another possibility is using your soap’s packaging (such as a tin or tub) and spooning the hot soap directly into that. But, unless you’re planning on selling your shaving soap, this can be impractical; packaging can typically only be ordered in quantities in the hundreds, so it’s prohibitively expensive. In order to save a little money, we’re going to get a little creative here. Soap making is a niche hobby, and niche hobby products demand a premium. Baking, on the other hand, is a little more mainstream. 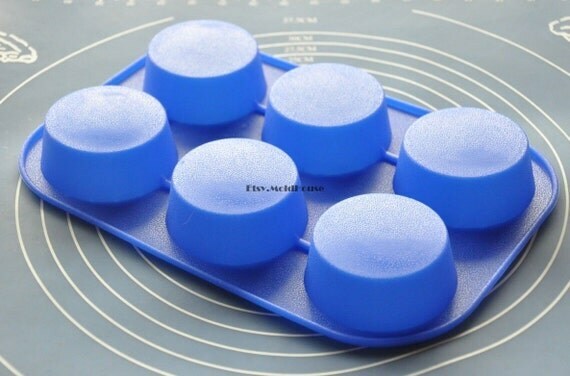 Check out these individual silicone cupcake molds, for example. Silicone is safe for hot soap, dishwashers, and it’s non-stick. It’s pretty perfect for a shaving soap mold. If you’re not into the Reese’s cup look, you can also check out this silicone muffin pan. If you go with any of these silicone options, make sure you keep the mold on something solid like a baking tray or plate. Silicone is quite flexible and not exactly ideal for balancing a bunch of hot soap. Great options for lower cost silicone molds can be imported from other countries such as China. With Etsy’s increasingly ambiguous rules around reselling comercially-manufactured products, it’s become a good source for products such as shaving soap molds. Now, you might disagree with the morality of buying these products on Etsy, because they’re potentially undercutting and crowding out genuine artisan products… but I’ll leave that decision up to you. Either way – this is a few bucks cheaper than bakeware. You can also check out this straight-sided cupcake/soap silicone mold on Amazon. Personally, I think this is the best option dollar-for-dollar. Don’t worry. I get it. You’ve got to honor that pioneer spirit. Go to your local hardware store. Grab a 12″ section of 2″ to 3″ diameter PVC pipe and a hose clamp that will fit around it. Take some saran wrap or similar material to cover one end of the pipe. Tighten the clamp up around it so no soap escapes. Pour your soap into the top. Knock the pipe on a counter or other hard surface in between spoonfuls to knock any air bubbles up to the surface. Let your soap cool and solidify. Keep in mind – this method will leave you with a long cylinder of soap that will need to be cut. If the soap is quite soft, it might come out a little less than perfect after it’s removed from the mold and cut. This one is for those of you who don’t like spending money – unless it’s on chips. Just use the Pringles can in place of the PVC pipe. You can also replace the hose clamp with a strong elastic band. Boom. Free shaving soap mold with a side of chips. Maybe you can convince that weird Pringles guy to go clean-shaven with your amazing soap. Thanks for reading this post at ShaverSoaper. How is your soap making journey going? Leave your comments and questions below!